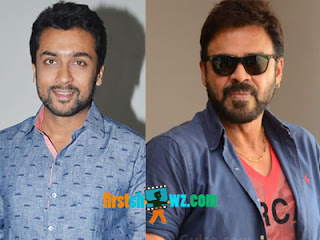 Home / News / Another multistarrer for Venkatesh and Suriya is his co-star! Another multistarrer for Venkatesh and Suriya is his co-star! Venkatesh has two multistarrers under shoot Varun Tej and Naga Chaitanya respectively but it isn't stopping the actor from signing another multistarrer. And this time, it's Suriya who's his new co-star in the next film. Venkatesh has signed a movie with Nenu Local director Nakkina Trinadh Rao and if the buzz is to be believed, the film is a multistarrer. This will be the first ever time, Venkatesh and Suriya will be sharing screen space. It's to be seen if Suriya plays a lengthy role or a short role. We hear that Suresh Babu will produce the movie under their home banner Suresh Productions. More details are awaited.